Lately I've been thinking about why I enjoy working with Macs so much. Since switching to Macs from Windows a little over a year ago I've tried as much as possible to approach it objectively, calling out both the good and bad as I learned my way around OS X, and recording my findings here in this blog. It's easy to cite the UI consistency I enjoy with Mac based applications. As a software developer that obsesses with user interface design I have a deep appreciation for disparate applications using similar controls and metaphors. It's difficult enough for people to understand the underlying tasks and logic a software application can perform, making them learn different control surfaces is like asking someone to navigate through their own family room after you have rearranged the furniture and turned off the lights; lots of stubbed toes and muttered curse words are sure to ensue. Instead of the UI, I'm finding the real draw for me has been how productive I am as a power user. As a Windows user I never questioned the Mac's user interface. It looked "pretty", a back-handed compliment if there ever was one. What I did not know, and not a single Mac advocate ever mentioned to me for fear of scaring me away (I assume), was that Macs could channel that inner power user like no other machine could. 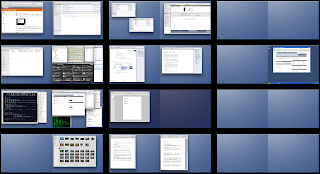 At any given time I'm running a dozen or so applications, many comfortably set up in their own Spaces window. I can switch between the programs by hitting the familiar Command-Tab. If I need to launch a new application I use LaunchBar, without question one of the best productivity tools you can get for a Mac (Quicksilver provides a similar capability). No reaching for the mouse and hunting for the application I want to run; I simply hit Command-Space, type 2-3 letters and hit Return and my application is loaded almost immediately. If the application is already running it just switches to it. My Mac Pro serves as my communications center as well, serving up my email through Apple's Mail program, AIM and Gmail chat through Adium, my Twitter feeds through TweetDeck and my incoming and outgoing phone calls through Skype. If I need to call a number I hit Command-Space, type "call" and enter (or paste) the phone number I want to dial. If I decide I want to contact someone that's not visible through Adium I'll just hit Command-Space and start typing their name. Once their name appears in the LaunchBar menu I can hit the right arrow key and choose either an email address or phone number. If I choose an email address a new mail message is created with them as the recipient and I'm ready to start composing my message. If I select a phone number Skype takes over, gradually muting the John Coltrane track I have playing on iTunes as the phone begins to ring. I hang up the call and the music comes back. Meanwhile down in my development Space I've got TextMate (my preferred programming editor), MySQL query browser and three terminal windows open. In one of the terminal windows I have an SSH session to one of my production servers open and am running a tail on one of my logs. The other two terminal windows are positioned in specific directories so that I can quickly execute commands for my Ruby on Rails based application and monitor the debug output from my local server instance. Safari is open in that same Space with the local version of SharedStatus up and running in it. I even have Windows XP running in a VMware Fusion instance with Internet Explorer loaded and accessing my local version of SharedStatus so that I can be sure it works properly in that particular browser. If you are a power Windows user that wants to dismiss the Mac as just a simplistic and trendy consumer machine—something I was guilty of—you may want to reevaluate that position. In my experience I've found Macs to be the computing equivalent of automotive sleepers; they look soft and simple on the outside but as soon as you push it you realize it's capable of extreme performance. So I never was a power Windows user, I was actually one of the biggest preachers against computer use when I had my Windows machine. After having all of our Windows software stolen we made the switch to Mac and now I'm considered one of the biggest "geeks" in my industry. I still wouldn't consider myself a power-user but I wouldn't even BE a user at all if I hadn't had a Mac. Time to add in AppleScript and Automator. Then you'll really have some power. @Paul: I've only played with AppleScript briefly; since I write a lot of Ruby code I find that works best for my needs. @Anon: Sorry about that! I've been using LaunchBar (and before that QuickSilver) for so long I forgot that Command-Space is usually Spotlight's activation sequence. I remapped Spotlight—which I still use occasionally to search for some documents—to Control-Space. @Gabor: Yes, most of what I handle in Launchbar can be handled in Spotlight, with the notable exception of the tertiary commands (finding a contact, then sub-selecting the action to take on that person). I've also found that Spotlight isn't nearly as fast as LaunchBar or Quicksilver. I wholeheartedly agree with David. I've been a Windows power user and Microsoft platform developer for almost 2 decades now. In late 2007, some PC-type magazine rated the MacBook Pro as the best Windows laptop in their round up. I did a double take, read the article, and then started looking for other Windows developers who have switched, as well as applications I would have to use if I were to make the transition. While I still don't like OSX's UI, I can do more than I could on my annually-purchased power laptops. I immediately became more productive from a development perspective. Being able to run 2-3 Windows virtual machines has been a big boost for me. Throw on some killer design and build quality and I know I'll be a mac user for life. I am currently a contractor Oracle DBA at a local business. I have been issued a Dell with WinXP that I only recently was allowed to take home to do VPN access stuff for the client. On my first day I didn't know what I'd be issued, so I took my Macbook (as I do everywhere when I can) so I could get started doing things. They did give me a Dell with WinXP the first day that was all integrated to their IT standards but just in case, I had my Macbook hooked up to their [wired] network with a Parallels Windows XP VM and Office for Mac for Excel and other Office stuff, along with DBA tools on the VM in case I needed it. Initially a lot of my work was with Terminal, and within Terminal I was able to get to all of their UNIX servers to do my job, and later with DBA tools on Windows both on the Parallels VM and the Dell to really effectively do my job. For certain parts of the job when I'm doing UNIX things I'll turn to my Macbook, for other things that are pertinent to the company such as internal email, Intranet stuff, shares, etc. I'll use the Dell. Between the two I've been quite effective in performing my duties. I've since been allowed to take the Dell home and given VPN access 'just in case' I am called to do something remote. Usually, however the Dell remains in my bag while I set up my Macbook in the home office. I only pull out the Dell (which I have set up pretty nicely with a dual-external monitor deal with the Dell's internal spanned) if I get called. No call, no Dell. The Macbook gets plugged into my other external monitor, drives, printer, etc. My point here was driven home when I was talking with my co-worker about taking the computer home. She noted that I was one of those types who when at home I use my computer to get on the 'net and do stuff (as I've done for years with a lot of different OS's) while she does not. That got me thinking that the reason I do that is that my computer (my computer being the Macbook), in addition to being a powerful productivity tool, is just straight out more pleasant to use whether that be doing hard-core work type stuff, or "leisure computing" going out to the net, YouTube, etc. It's nicer to look at, takes the "work" out of workflow for anything, and is just overall more capable than the Dell. You can do Apple events in Ruby and Python too. @Paul: Very cool - thanks for the tip! the various arrow and other character keys. That's on a laptop. If you use the Apple keyboard, it's got 7 blank keys, so that's 21 more! I'm hardly using LauncBar anyomore: Crtl+ P = Photoshop. Ctl+W + Word. You can also use it for repetitive phrases: Ctrl+J=my email address. WAAAY cool. Did I mention it's free?? @Jeff: Spark does indeed look interesting. Here's a link if anyone else is interested. Actually, what I don't get is the people who think Macs are user-friendly but not powerful. If anything, the case is exactly the opposite. I mean, until I switched last fall, I did my power computing on a combination of Windows boxes and Linux boxes. But my MacBook Pro can literally do everything I ever did on either of those except run Valgrind. (And if I thought I was going to be working away from my local network for an extended period, I could always install a Linux virtual machine on Parallels and run Valgrind there.) And the power user experience is generally nicer. The UI for many common Unix-y things is just plain beautiful. And I adore TextMate, don't know how I lived without it all these years. And what is up with iTunes? I'd heard that it was only clunky on Windows, but despite routinely using 20+ threads (yay Activity Monitor!) it still makes me wait on it depressingly often. And what is up with marking network files it can't get to unavailable? What keeps on happening is I'm listening to my collection (stored on one of the Linux boxes downstairs) on shuffle, and suddenly the wireless drops out for a couple of minutes (another weird Mac trick I've not run into on Windows laptops). As a result, it shuffles through my collection marking dozens of songs unavailable until it finally hits a song stored on the laptop. Then I have to go through the collection by hand fixing it. I had a development team that was part of a Mac pilot for a traditionally Windows-based company. We were able to demonstrate real-world productivity cost savings in just a month. Compile times dropped in half and we had support for all the third party applications that had been chosen beforehand. I miss the MacBook Pro. I will probably purchase one for myself when Apple produces a version running on the new Intel Core i7. With 8 "effective" cores, you really can't beat it for multi-VM development. Anyone know when Apple might have support for the i7? Thanks - have been considering switching - seems everyone is doing it. Just, while I don't like everything about a PC - it is still comfortable. But, i think now is the time to switch.